The name of this component is "Shape". This name shall be used when referring to this component in the COMPONENT statement (see 7.2.5.4 Component statement). This clause describes the Shape component of this part of ISO/IEC 19775. The Shape component defines nodes for associating geometry with their visible properties and the scene environment. Table 12.1 provides links to the major topics in this clause. The Shape node associates a geometry node with nodes that define that geometry's appearance. Shape nodes shall be part of the transformation hierarchy to have any visible result, and the transformation hierarchy shall contain Shape nodes for any geometry to be visible (the only nodes that render visible results are Shape nodes and the background nodes described in 24 Environmental effects). A Shape node contains exactly one geometry node in its geometry field, which is of type X3DGeometryNode. The Shape node descends from the abstract base type X3DShapeNode. Shape nodes may specify an Appearance node that describes the appearance properties (material, texture and texture transformation) to be applied to the Shape's geometry. All valid children of the Appearance node descend from the abstract base type X3DAppearanceChildNode. This set may be extended by creating new nodes derived from the X3DMaterialNode abstract base type. This set may be extended by creating new nodes derived from the abstract X3DTextureNode base class as defined in 18.3.2 X3DTextureNode. A polygon defines a front face based on the direction of the normal. That normal is either explicitly provided by the end user or implicitly calculated by the browser based on the winding rules for the node (see the ccw field on many of the polygonal geometry nodes such as IndexedFaceSet). The TwoSidedMaterial node provides a way to render the front and back sides of the polygon with different material properties. Figure 12.1 depicts the effects of the TwoSidedMaterial node. When the back side of the material is rendered using the alternate colours, the rendering shall follow the normal lighting equations for lit geometry. This is the base node type for the child nodes of the X3DAppearanceNode type. This is the base node type for all Appearance nodes. This is the base node type for all Material nodes. This is the base node type for all Shape nodes. The Appearance node specifies the visual properties of geometry. The value for each of the fields in this node may be NULL. However, if the field is non-NULL, it shall contain one node of the appropriate type. The material field, if specified, shall contain a Material node. If the material field is NULL or unspecified, lighting is off (all lights are ignored during rendering of the object that references this Appearance) and the unlit object colour is (1, 1, 1). Details of the X3D lighting model are in 17 Lighting component. The texture field, if specified, shall contain one of the various types of texture nodes (see 18 Texturing component). If the texture node is NULL or the texture field is unspecified, the object that references this Appearance is not textured. The textureTransform field, if specified, shall contain a TextureTransform node as defined in 18.4.8 TextureTransform. If the textureTransform is NULL or unspecified, the textureTransform field has no effect. The lineProperties field, if specified, shall contain a LineProperties node as specified in 12.4.3 LineProperties. If lineProperties is NULL or unspecified, the lineProperties field has no effect. The fillProperties field, if specified, shall contain a FillProperties node as specified in 12.4.2 FillProperties. If fillProperties is NULL or unspecified, the fillProperties field has no effect. The shaders field contains a listing, in order of preference, of nodes that describe programmable shaders that replace the fixed rendering requirements of this part of ISO/IEC 19775 with user-provided functionality. If the field is not empty, one shader node is selected and the fixed rendering requirements defined by this specification are ignored. The field shall contain one of the various types of shader nodes as specified in 31 Programmable shaders component. The FillProperties node specifies additional properties to be applied to all polygonal areas on top of whatever appearance is specified by the other fields of the respective Appearance node. Thus, hatches are applied on top of the already rendered appearance of the node. Thus, if filled is TRUE, the polygonal area is filled according to the other fields of the Appearance node. If hatched is TRUE, the polygonal area is hatched as specified by the hatchStyle field. Hatches shall be applied after fills are applied. The hatchStyle field selects a hatch pattern as defined in the International Register of Graphical Items (see 2.[REG]). 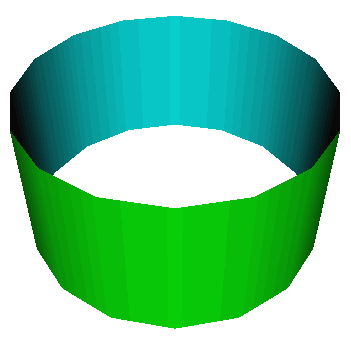 The hatches are rendered using the colour specified by the hatchColor field. Browsers shall support hatchstyles 1-6 with hatchstyle 1 being the default. X3D browsers may support any other of the registered hatchstyles. If a hatchstyle that is not supported is requested, hatchstyle 1 shall be used. Table 12.2 specifies the first nineteen hatch styles as defined in the Hatchstyle Section of the International Register of Items. Examples of each hatch style are available at the International Register of Items. The associated geometry shall be filled and/or hatched only when the respective values of the filled and/or hatched fields have value TRUE. The LineProperties node specifies additional properties to be applied to all line geometry. The linetype and linewidth shall only be applied when the applied field has value TRUE. When the value of the applied field is FALSE, a solid line of nominal width shall be produced. The colour of the line is specified by the associated Material node. The linetype field selects a line pattern as defined in the International Register of Graphical Items (see 2.[REG]). X3D browsers shall support linetypes 1 through 5 with linetype 1 being the default. X3D browsers may support any other of the registered linetypes. If a linetype that is not supported is requested, linetype 1 shall be used. Table 12.2 specifies the first sixteen linetypes as defined in the Linetype Section of the International Register of Items. The arrowhead is drawn as short lines forming barbs at any convenient angle between 15 and 90 degrees. The arrowhead is closed and filled in. For linetype "single arrow", the arrowhead is rendered so that the arrow tip occurs at the last point of the each individual list of points passed to a polyline and is in the direction of the last vector. For linetype "double arrow", the first arrowhead is rendered so that the arrow tip occurs at the first point of the list of points passed to a polyline and is in the reverse direction of the first vector. The second arrowhead is rendered as for "single arrow" at the opposite end of the polyline. The linewidthScaleFactor is a multiplicative value that scales a browser dependent nominal linewidth by the linewidth scale factor. This resulting value shall then be mapped to the nearest available line width. A value less than or equal to zero refers to the minimum available line width. The Material node specifies surface material properties for associated geometry nodes and is used by the X3D lighting equations during rendering. 17 Lighting component contains a detailed description of the X3D lighting model equations. All of the fields in the Material node range from 0.0 to 1.0. The ambientIntensity field specifies how much ambient light from light sources this surface shall reflect. Ambient light is omnidirectional and depends only on the number of light sources, not their positions with respect to the surface. Ambient colour is calculated as ambientIntensity × diffuseColor. The diffuseColor field reflects all X3D light sources depending on the angle of the surface with respect to the light source. The more directly the surface faces the light, the more diffuse light reflects. The emissiveColor field models "glowing" objects. This can be useful for displaying pre-lit models (where the light energy of the room is computed explicitly), or for displaying scientific data. The specularColor and shininess fields determine the specular highlights (e.g., the shiny spots on an apple). When the angle from the light to the surface is close to the angle from the surface to the viewer, the specularColor is added to the diffuse and ambient colour calculations. Lower shininess values produce soft glows, while higher values result in sharper, smaller highlights. The transparency field specifies how "clear" an object is, with 1.0 being completely transparent, and 0.0 completely opaque. The Shape node has two fields, appearance and geometry, that are used to create rendered objects in the world. The appearance field contains an Appearance node that specifies the visual attributes (e.g., material and texture) to be applied to the geometry. The geometry field contains a geometry node. The specified geometry node is rendered with the specified appearance nodes applied. See 12.2 Concepts for more information. 17 Lighting component contains details of the X3D lighting model and the interaction between Appearance nodes and geometry nodes. If the geometry field is NULL, the object is not drawn. The bboxCenter and bboxSize fields specify a bounding box that encloses the Shape node's geometry. This is a hint that may be used for optimization purposes. The results are undefined if the specified bounding box is smaller than the actual bounding box of the geometry at any time. A default bboxSize value, (-1, -1, -1), implies that the bounding box is not specified and, if needed, is calculated by the browser. A description of the bboxCenter and bboxSize fields is contained in 10.2.2 Bounding boxes. This node defines material properties that can effect both the front and back side of a polygon individually. These materials are used for both the front and back side of the geometry whenever the X3D lighting model is active. If the separateBackColor field is set to TRUE, the rendering shall render the front and back faces of the geometry with different values. If the value is FALSE, the front colours are used for both the front and back side of the polygon, as per the existing X3D lighting rules. When calculating the terms in the lighting equations, the front geometry shall use the fields ambientIntensity, diffuseColor,emissiveColor, shininess, specularColor, and transparency. The faces that are determined to be the back side are rendered using backAmbientIntensity, backDiffuseColor, backEmissiveColor, backShininess, and backTransparency as the appropriate components in the lighting equations. The Shape component provides three levels of support as specified in Table 12.4.
lineProperties not supported. fillProperties not supported. Shaders not supported. Material ambientIntensity optionally supported. shininess optionally supported. specularColour optionally supported. A Material with emissiveColour not equal to (0,0,0), diffuseColor equal to (0,0,0) is an unlit material. One-bit transparency; transparency values ≥ 0.5 transparent. Shape All fields fully supported. Texturing 1 All fields fully supported. All Level 1 Appearance nodes except Appearance All fields fully supported. Appearance fillProperties not supported. Shaders not supported. LineProperties All fields fully supported. All Level 2 Appearance nodes All fields fully supported. FillProperties All fields fully supported. All Level 3 Appearance nodes All fields fully supported. TwoSidedMaterial All fields fully supported.